Antonio Molinar married Josefa Munos. They had a son Vicente Molinar born in Mexico circa 1810. Vicente Molinar married Petra Carrasco January 12, 1839 in Jesus Nazareno Temple, Ojinaga. They had seven children. 1. Dolores, 2. Victoriano, 3. Mariano, 4. Silverio, 5. Atilano, 6. Carmen, 7. Juana. 1. Daughter Dolores Molinar was born 1838 in Ojinaga (birth year as shown in marriage record). She married Ramon Mesa March 5, 1870 in Jesus Nazareno Temple, Ojinaga. He was born in 1846 in Rio Florido, Mexico. Remedios Contreras was born in 1849 in Ojinaga. They were married in Jesus Nazareno Temple 17 May 1870. There were no known children. Jesus Baeza, they were married circa 1875. They had five children: A. Alberto, B. Juan, C. Paz, D Benigna, E. Jose, (see below for details). Rosario Galindo Mesa, they were married circa 1888. They had six children: F. Maria, G. Vicente, H. Victoriano, I. Valente, J. Cruz, K. Andres, L. Eduardo. (see below for details). A. Son Alberto Molinar was born in Mexico 8 June 1877 and immigrated to the United States in 1890. He married Luisa Jaquez July 10, 1912 in Terlingua. They were married by Justice of the Peace R.A. Wilson. Louisa was born in Presidio, Texas August 25, 1891, the daughter of Rumaldo Jaquez and Severa O. Contreras. Alberto died in Midland Memorial Hospital July 30, 1956. Louisa died at her home in Midland on April 5, 1966. Both are buried in Fairview Cemetery in Midland. In the Terlingua area Alberto engaged in farming, ranching and freighting. He owned the northern half of Section 38 of Block 17. The southern half was owned by his cousin, Antonio Franco. The Molinar School was located on Alberto’s property. The building on the left was the school and teacher residence. A large water tank is in the foreground. The photo was taken around 1926. Students at the Molinar School, probably 1932. - In March 1915 he received $19.49 from Chisos Mining Company for hauling freight. This included 75 cents for hauling a box of books to Slight’s Drug Store in Alpine. - In 1916 he hauled 79,143 pounds of freight for Study Butte Mining Co. for $395.72. - In January 1917 he sold 195 pounds of beans to Study Butte Mining Co. for $19.50. - In 1917 he hauled 371,828 pounds of freight for Study Butte Mining Co. for $1,972.99. That is equal to more than four years pay for the average miner. - In 1918 he hauled 184,284 pounds of freight for Study Butte Mining Co. for $1,165.80. - In 1918 he sold 22.63 cords of fuel wood to Study Butte Mining Co. for $226.25. - In 1919 he earned $319.63 for hauling freight for the Study Butte Mining Co.
- In February 1925 he hauled cotton seed for La Harmonia Co. in Castolon for $60.44. - In March 1917 he received $53.25 from La Harmonia Co. for hauling eight bales of cotton (3926 pounds) to Alpine and returning with 11 barrels of gasoline (4950 pounds). He departed on March 3rd and returned on the 16th. - In November 1929 he sold 1549 pounds of cotton to La Harmonia Co. for $76.11. 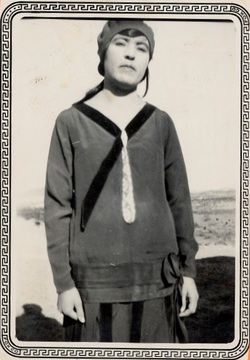 (1) Daughter Jesus Jaquez Molinar was born August 7, 1913 in Terlingua. She married Roman De La O September 10, 1938. He was the son of Roman De La O and Tomasa Morales and was born on the De La O Ranch, near Castolon, July 7, 1913. Roman worked for the Chisos Mining Co. in 1940 and for the Kokernot Ranch, near Alpine, in 1945. Jesus died September 27, 1972 and Roman died February 26, 1980. Both died in Alpine and both are buried in Holy Angels Cemetery. Jesus and Roman had 10 children. a. Son Alfredo De La O was born June 28, 1939 in Terlingua. In 1980 he was living in Alpine. He died in Odessa Medical Center August 6, 2006 and probably is buried in Alpine. aa. Son Michael Ross Peña was born in Andrews County, Texas February 10, 1960.
bb. Daughter Monica Liza Peña was born June 27, 1961 in Brewster County. cc. Son Higinio Peña, III was born April 30, 1963 in Brewster County. dd. Son Jesus Joel Peña was born May 26, 1964 in Brewster County. aa. Son Robert “Bobby” De La O was born in Alpine July 26, 1964. He died August 29, 1982 and is buried in Holy Angels Cemetery. aaa. Son Robert Roman Carrillo was born in Alpine July 17, 1991. In March 2012 he was attending the University of Florida in Tallahassee. bbb. Daughter Celia Julissa Carrillo was born in 1998 and in March 2012 was living with her parents in Fremont, California. ccc. Daughter Eliza Mia Carrillo was born in 2002 and in March 2012 was living with her parents in Fremont, California. aaa. Daughter Maya De La O was born in 2004 and in March 2012 was living with her parents in Round Rock. bbb. Son Bobby De La O was born in 2005 and in March 2012 was living with his parents in Round Rock. dd. Daughter Amanda De La O was born in Alpine Oct 23, 1984. In March 2012 she was living in San Antonio and was working as a Financial Analyst for Bromley Communications. d. Son Claudio De La O was born June 6, 1945 in Brewster County. In August 2006 he was living in Fayetteville, Arkansas. aa. Daughter Jessica Rae Dyer was born April 8, 1973 in El Paso. aa. Son Glenn Alfred Espinosa was born in Brewster County 5 December 1974.
bb. Son Raul Rene Espinosa was born in El Paso May 11, 1978.
cc. Son Damian Joel Espinosa was born in El Paso March 5, 1982.
aa. Daughter Roberta Yvette De La O was born in Alpine May 18, 1971.
h. Daughter Maria Edudina De La O was born July 6,1952 in Alpine. She died November 23, 1952 in Alpine of gastroenteritis and is buried in Holy Angels Cemetery. i. Daughter Berta Alisia De La O was born December 18, 1953 in Alpine. In 1980 she was living in Alpine, married name Rodriguez. In August 2006 she was living in Alpine, married name Benavidez. j. Son David De La O was born in Alpine April 14, 1955. He was living in Alpine in August 2006. (2) Daughter Benigna Molinar was born February 9, 1915 in Terlingua. She died in Midland Memorial Hospital March 23,1993 and was buried in Presidio. She married Jesus Manuel Rodriguez and they had six children. a. Son Jose Molinar Rodriguez was born August 17, 1947 in Alpine and died there the same day. He is buried in Alpine. b. Daughter Ester Rodriguez was born in Alpine November 20, 1948. In April 1993 she was living in Harlingen, TX. Her married name is Gutierrez. c. Daughter Maria Louisa Rodriguez was born in Alpine June 1, 1950 and was living in Alpine in April 1993. Her married name is Manzano. In November 2011 she was living in Brownsville, TX. d. Son Adan M. Rodriguez was born in Alpine March 27, 1953. He was living in Big Spring, TX in April 1993.
e. Daughter Rebecca Rodriguez was born in Presidio in 1955. She was living in King City, California in April 1993. Her married name is Merrill. f. Son Alberto M. Rodriguez was born in Pecos County August 15, 1956. He was living in Big Spring, Texas in April 1993. In November 2011 he was living in New Mexico. a. Son Jesus M. Rodriguez was living in Pittsburg, CA in April 1993.
b. Daughter Irma Rodriguez was living in Lewisville, TX in April 1993. Her married name is Gates. aaa. Daughter Amanda Molinar was born March 26, 1987 in Alpine. 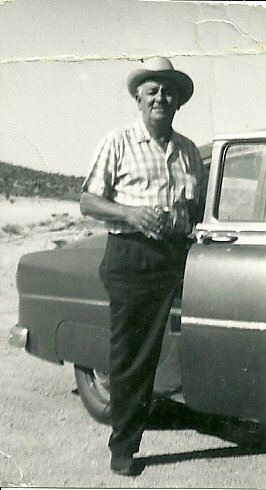 (3) Son Jose Jaquez Molinar was born 15 August 1916 in Terlingua. He married Hazel Waters. She was born circa 1917 in Texas, the daughter of William H. Waters and Noberta "Beta" White. They lived in the Midland area from 1948 until 1971. Jose was a U.S. Navy Veteran of World War II. At the time of his death, Jose was working as a laborer for South Construction Co. He died in Midland September 5,1971 of a gunshot wound of the heart, having been shot during an argument. Hazel died in Permian Lodge in Midland June 12, 1974 of Carcinoma of the Cervix. Both are buried in Fairview Cemetery. Jose and Hazel had thirteen children. aa. Son Lorenzo “Larry” Robledo was born December 17, 1956. His wife’s name is Susana. bb. Daughter Rosa Anna Robledo was born October 16, 1958.
cc. Daughter Ida Robledo was born April 18, 1961. She married Edward Rangel. dd. Daughter Sue Ann Robledo was born June 2, 1963.
ee. Daughter Paula Jean Robledo was born November 16, 1964. She married Carlos Rangel. ff. Daughter Melissa “Missie” Robledo was born June 15, 1967. She married Richard Soto. gg. Daughter Guadalupe “Lupe” Robledo was born November 7, 1969. She married Scott Turner. aa. Daughter Elizabeth Ann Molinar was born May 9, 1962 in Midland. She married Keller N. Thornton March 1, 1985.
bb. Daughter Brenda Molinar was born August 28, 1963 in Midland. She married Arturo Contreras June 3, 2000.
cc. Daughter Christina Molinar was born September 30, 1964 in Midland. She married Benito Ramos December 13, 1997.
dd. Son Frank Joe Molinar was born September 24, 1968 in Midland. ee. Son Victor Joe Molinar was born July 19, 1969 in Midland. c. Daughter Hazel Ann Molinar was born October 21, 1944 in Presidio County. She was living in Midland in March 2011. Her married name is Velarde. d. Daughter Olivia Molinar was born September 8, 1946 in Presidio County. She was living in Weatherford, Texas in March 2011. Her married name is Avalos. e. Daughter Alma Linda Molinar, twin of Rose Linda, was born in Marfa June 14, 1948. She died in Marfa September 10, 1958 and is buried in the Marfa Cemetery. f. Daughter Rose Linda Molinar, twin of Alma Linda, was born in Marfa June 14, 1948. She died in Marfa September 10, 1958 and is buried in the Marfa Cemetery. g. Daughter Gloria Molinar was born April 8, 1950 in Presidio County. She was living in Valentine in March 2011. Her married name is Sanchez. h. Son James “Jimmy” Molinar was born November 30, 1951 in Martin County. In March 2011 he was living in California. i. Son Raul Molinar was born May 1, 1953 in Martin County. In March 2011 he was living in Mississippi. j. Daughter Sylvia Molinar was born March 13, 1954 in Martin County. She was living in Midland in March 2011. Her married name is Behenio. k. Daughter Beatrice Molinar was born February 15, 1956 in Martin County. She was living in Valentine, Texas in March 2011. Her married name is White. l. Daughter Berta Molinar was born November 27, 1957 in Martin County. She was living in Arizona in March 2011. Her married name is Height. m. Son Eduardo “Eddie” Molinar was born November 1, 1961 in Midland. In March 2011 he was living in Midland. 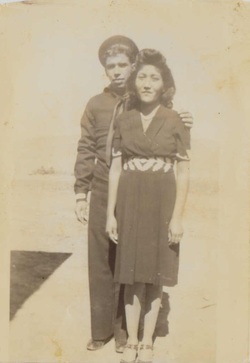 (4) Daughter Maria Molinar was born circa 1918 in Terlingua. a. Son George Molinar Tucar, Jr. was born in Terlingua April 28, 1941. In 1957 he was living in Midland and working as a delivery boy for Permian Reproduction Company. He died June 1, 1957 from injuries suffered in an automobile accident in Odessa and is buried in the Fairview Cemetery in Midland. (6) Son Alberto Molinar (Jr.) was born December 29, 1921 in Terlingua. He died in Medical Center Hospital, Odessa, on September 22, 2002 and was buried in Rose Hill Cemetery, Odessa, with full military honors He was a U.S. Army Veteran who served in Normandy. He married Anita Flores in January 1950. They had eight children. a. Son Alberto Molinar was born April 8, 1949 in Pecos County. He was living in Odessa in September 2002.
aa. Son Antonio Manuel Molinar, twin of Albert Miguel, was born in Odessa December 11, 1976.
bb. Son Albert Miguel Molinar, twin of Antonio Manuel, was born in Odessa December 11, 1976.
cc Son Alexander Joel Molinar was born in Dallas July 16, 1980.
dd. Son Arturo Jose Molinar was born in Dallas November 29, 1982.
c. Son Oscar Molinar was born January 22, 1952 in Martin County. He was living in Houston in September 2002.
d. Son Orlando Molinar was born July 11, 1953 in Pecos County. He married Guadalupe Sanchez. Orlando was living in St. Paul, Minnesota in September 2002. He and Guadalupe had two children, both living in St. Paul in January 2011.
aa. Daughter Antoinette Molinar was born July 10, 1979 in St. Paul, Minnesota. bb. Daughter Nicolette Molinar was born September 5, 1983 in Odessa. aa. Son Johnny Molinar, Jr. was born March 25, 1974 in Denton County. bb. Son Christopher Lopez Molinar was born May 19, 1975 in Andrews County. cc. Daughter Melissa Lopez Molinar was born April 14, 1982 in Odessa. aa. Son Dane Mathew Molinar was born in Odessa April 15, 1988.
bb. Daughter Mary Molinar married Andrew Mersmann. In September 2002 they were living in San Antonio. cc. Son Eddie Molinar was living in Odessa in September 2002. (7) Daughter Luz Molinar was born circa 1923 in Terlingua. She married Sabino Macias April 21, 1946. He was born February 26, 1921 in Terlingua. He was the son of Benjamin Macias and Nicolasa Levario. (See http://www.lifebeforetheruins.com/juan-macias-1.html for more information on the Macias family.) Luz and Sabino had one known child. a. Daughter Elia Macias was born April 15, 1947 in Alpine. 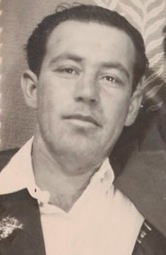 (8) Son Victoriano Molinar was born August 13, 1925 in Terlingua. (9) Son Antonio Molinar was born February 9,1927 in Terlingua. He married Enriqueta Hernandez. She was born circa 1930, the daughter of Florencio Hernandez and Ester Cordova. They had two known children. a. Daughter Delma Molinar was born August 24, 1948 in Brewster County. b. Daughter Nora Molinar was born August 29,1949 in Brewster County. (10) Son Conrado Molinar was born November 13, 1928 in Terlingua. (11) Son Arturo Molinar was born October 3, 1931 in Terlingua. a. Daughter Maria Esther Deanda was born March 7, 1954 in Brewster County. b. Daughter Aida Deanda was born July 13, 1955 in Brewster County. c. Son Raul Deanda was born July 6, 1957 in Odessa. d. Son Larry Deanda was born December 7, 1958 in Odessa. e. Daughter Rose Linda Deanda was born October 14, 1960.
f. Son Jose Luis Deanda was born April 6, 1965 in Odessa. B. Son Juan Baeza Molinar was born circa 1878 in Mexico. He died in Lockhart Clinic Hospital, Alpine on April 26, 1949 and is buried in Holy Angles Cemetery. He married Zenaida Gonzalez circa 1906. She was born in Mexico circa 1888, the daughter of Paz Gonzalez and Jesus Herrera. Zenaida died in Brewster County Memorial Hospital on August 4, 1960 and is buried in Holy Angels Cemetery. She had been a resident of Alpine since 1953. Juan was a land owner, farmer, rancher and freighter. Circa 1923 he purchased Section 224 of Block G4 from the Bonifacio Vega family. He still owned that land in 1934. The increase in his state and local tax assessments between 1922 ($8.77) and 1924 ($18.35) reflect the acquisition of this property. Little specific information is available on Juan’s farming and ranching activities. In 1921 he was raising chickens and frequently traded eggs for merchandise at the Chisos Mining Company store. In 1929 he raised 2,680 pounds of cotton, which he sold to the La Harmonia Company in Castolon for $143.00. On 21 June 1932 he sold four steers to the Wayne Cartledge Ranch for $46.00. On 19 January 1933 he sold six more steers to the same ranch for $9.00 each. - In March 1915 he received $38.53 from Chisos Mining Company for hauling freight. - October 10, 1916: hauled freight for Chisos Mining Co. for $71.29. - June 1918, hauled 13,133 pounds of freight for Study Butte Mining Co. for $98.50. - October 1918, hauled 12,607 pounds of freight for Study Butte Mining Co. for $94.55. - June 1, 1921, hauled freight for Chisos Mining Co. for $90.43. - July 11, 1921, hauled quicksilver for Chisos Mining Co. for $49.28. - July 25, 1921, hauled freight for Chisos Mining Co for $90.06. - January 31, 1927, hauled freight for Chisos Mining Co. for $99.59. - February 19, 1927, hauled freight for Chisos Mining Co. for $98.07. - March 15, 1927, hauled freight for La Harmonia Co. in Castolon for $35.57. (1). Son Victoriano Molinar was born January 19, 1907 in Presidio County. He died in Alpine March 19, 1938 of a gunshot wound to the chest. The death initially was ruled a homicide, but no additional details are available. 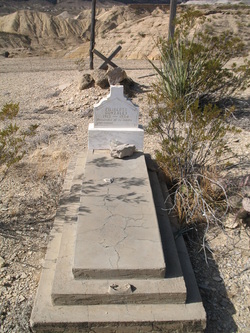 Victoriano is buried in the Terlingua Cemetery. (2). Daughter Jesus Molinar was born circa 1909 in Texas. She married Jose Del Toro, the son of Isabel Del Toro and Juana P. Perez in Terlingua. He was born in Mexico December 29, 1912 and worked as a brick layer in the building construction industry. According to his death record, Jose del Toro died May 25, 1951 while attempting to murder the local sheriff. The sheriff returned fire, hitting him in the abdomen. He is buried in Holy Angels Cemetery. After the death of Jose Del Toro, Jesus married Faustino Navarro in Carlsbad, New Mexico. They were divorced after a short time and Jesus moved back to Alpine. There were no known children of either marriage. Jesus died of a stroke at her home in Alpine October 11, 1953. She is buried in Holy Angels Cemetery. (3) Son Paz Molinar was born in Chisos (Terlingua) on March 4, 1910. He was baptized in Chisos on April 26, 1910 by Father Brocardus. His godparents were Patricio Dominguez and Ursula Rodriguez. He was a resident of Alpine in December 1967. He died in Alpine January 20, 1977 and is buried in Holy Angels Cemetery. a. Son Guadalupe Molinar was born May 30, 1943 in Brewster County. b. Son Anastacio Molinar, Jr. was born December 12, 1944 in Alpine. c. Daughter Viola Molinar was born July 4, 1946 in Brewster County. d. Daughter Sulema Molinar was born October 6, 1948 in Brewster County. e. Daughter Elma Molinar was born October 18, 1959 in Brewster County. f. Son Juan "Johnny" Molinar was born October 10, 1965 in Brewster County..
(5). 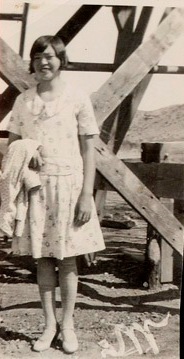 Daughter Eulalia Molinar was born 3 April 1914 in Terlingua. She died in Brewster Memorial Hospital, Alpine on 5 April 1990 and is buried in Holy Angels Cemetery. She married Gonzalo Rodriguez December 14, 1951. They had no known children. (6). Son Juan G. Molinar was born February 22, 1916 in Terlingua. He was baptized April 2,1916 in Chisos by Father M. Cuadrado. His godparents were Manuel Anaya and Sabina Aranda. He married Josefina Baeza Hernandez February 10,1942. She was born March 12, 1923 in Terlingua de Abajo, the daughter of Guadalupe Hernandez and Teresa Baeza. They had four children. a. Son Octavio Molinar was born September 11, 1944 in Brewster County. b. Daughter Gloria Molinar was born August 31, 1947 in Alpine. She died January 3, 1955 in Fort Davis Hospital of Rheumatic Fever and is buried in Holy Angels Cemetery, Alpine. aa. Daughter Marina Geanette Grado was born in Odessa April 7,1969.
bb. Daughter Josephine Griselda Grado was born in Odessa April 21, 1972.
d. Son Ruben Molinar was born May 29,1953 in Brewster County. (7). Son Enrique Molinar was born June 20, 1918 in Terlingua. He died September 24, 1993 in Medical Center Hospital, Odessa. He was a U.S. Army World War II Veteran and was buried in Holy Angels Cemetery with full military honors. He was a former employee of Big Bend National Park. aa. Son Charles Eric Brito was born in Travis County April 1, 1983.
bb. Daughter Leanna Nicole Brito was born in Travis County March 2, 1986.
b. Son Joe Louis Molinar was born January 29, 1962 in Odessa. He was living in Austin, TX in October 2002.
aa. Son Robert Lee “Bobby” Dominguez was born January 11, 1972 in Brewster County. He was raised by his grandparents Thelma and Jose White. aa. Son Alberto Dustin Garza was born in Brewster County January 29, 1987.
bb. Son Aaron Lance Garza was born in Brewster County November 27, 1990. 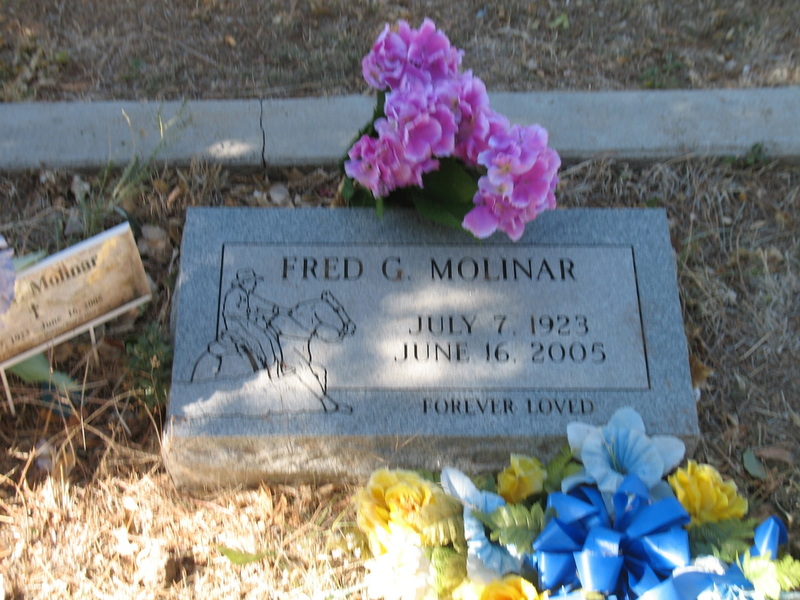 (10) Son Frederico “Fred” Molinar was born July 7, 1923 in Terlingua. He worked as a rancher in the Alpine area most of his life. He died in Hospice House, Odessa, January 16, 2005 and was buried in Holy Angels Cemetery, Alpine. He married Angela “Lillie” Gonzalez June 16, 1959 in Brewster County. She died August 1, 1987 and is buried in Holy Angels Cemetery. aa. Son Adan Molinar Fuentez was born February 13, 1970.
bb. Son Michael Molinar Fuentez was born May 15, 1973.
cc . Daughter Ruby Ann Molinar Fuentez was born February 20, 1979.
dd. Son David Molinar Fuentez was born February 4, 1982.
b. Daughter Maria Concepcion Molinar was born September 28, 1953 in Brewster County. c. Daughter Zenaida Molinar was born February 7, 1955 in Brewster County. d. Daughter Rosa Elva “Rosie” Molinar was born October 26, 1959 in Brewster County. Her married name was Trevino. a. Daughter Ema Molinar was born April 9, 1948 in Brewster County. aa. Son Jose Garcia III was born July 14, 1972 in Odessa. bb. Daughter Minica Jerome Garcia was born June 5, 1973 in Odessa. cc. Son Josiah Molinar Garcia was born April 2, 1984 in Odessa. aa. Daughter Andi Nicole Molinar was born October 25, 1983 in Odessa. bb. Daughter Krystal Lorae Molinar was born September 19, 1985 in Odessa. aa. Son Alan Anthony Armesto, Jr. was born in Odessa March 31, 1982.
bb. Son Derek Ryan Armesto was born in Odessa January 7, 1992.
aa. Son Adrian Robert Torres was born December 4, 1979 in Odessa. bb. Daughter Karisma Karistal Torres was born July 24, 1984 in Odessa. a. Daughter Diana Lee Molinar was born June 24, 1956 in Brewster County. She married Hector Alvarado. b. Daughter Wanda Molinar was born September 18, 1957 in Brewster County. Her married name is Taylor. (13). Son Herminio Molinar was born circa 1930 in Terlingua. In March 2012 he was living in El Paso. C. Son Paz Molinar was born in Texas circa 1879. He died in Terlingua January 19, 1942 and is buried in the Terlingua Cemetery. He married Maria Burgess circa 1905. She was born in Fortin in Presidio County, the daughter of Tomas Burgess and Virginia Carnero. Soon after the death of her husband in 1942, Maria moved to Alpine. She lived there until her death on February 4, 1956. She is buried in Holy Angels Cemetery. 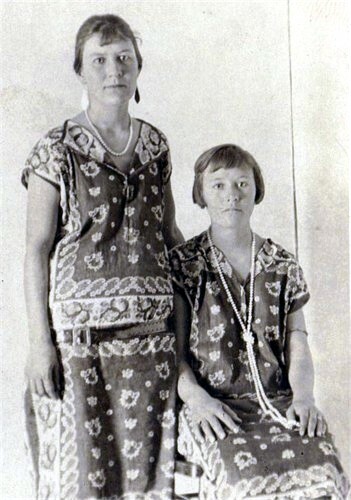 Paz and Maria probably lived in the Marfa area initially; their first child was born there in 1906. But by 1907 they had settled in the Terlingua area. Their home was on the west side of Terlingua Creek about two miles south of present-day Route 170. Paz owned three sections of land where he farmed and raised cattle and goats. These were Sections 301 and 302 of Block G4 and Section 18 of Block 17. He also was very active in the freighting business. - On March 22, 1915 he was paid $79.45 by Chisos Mining Company for hauling freight. - On October 10, 1916 he was paid $89.35 for hauling freight for Chisos Mining Co.
- On December 26, 1916 he was paid $45.45 for hauling freight for the Chisos Mining Co.
- Between February 1917 and March 1918 he hauled 62,755 pounds of freight for the Study Butte Mining Co. for $347.48. - On April 28, 1917 he was paid $72.05 for hauling freight for the Chisos Mining Co.
- On September 29, 1917 he was paid $65.47 for hauling freight for the Chisos Mining Co.
- On October 27. 1917 he was paid $59.17 for hauling freight for the Chisos Mining Co.
- In 1918 he sold 10.63 cords of fuel wood to the Study Butte Mining Co. for $106.25. - On June 19, 1921 he was paid $74.00 for hauling freight for the Chisos Mining Co.
- On June 20, 1921 he was paid $103.37 for hauling freight for the Chisos Mining Co.
- In January 1925 he was paid $63.65 for hauling freight for the La Harmonia Co. in Castolon. - In March 1925 he was paid $63.65 for hauling freight for the La Harmonia Co.
- On March 20, 1925 he and Antonio Franco were paid $302.44 for hauling freight for the La Harmonia Co.
- On January 29, 1927 he was paid $80.23 for hauling freight for the Chisos Mining Co.
- On February 1, 1927 he was paid $77.96 for hauling freight for the Chisos Mining Co.
- On February 21, 1927 he was paid $75.00 for hauling freight for the Chisos Mining Co. The activity with Chisos Mining Co. is based on incomplete records and probably was much more extensive than shown above. (1). Son Jesus Molinar was born August 1, 1906 in Marfa, Texas. He died in Odessa June 4, 1978 and is buried there. (2). Daughter Agripina Burgess Molinar was born in Terlingua on June 22, 1909. She was baptized in Big Bend (Study Butte area) on November 2, 1909 by Father Brocardus. Her godmother was Josefa Baeza. 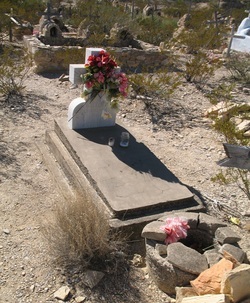 She died of pneumonia in Terlingua on March 31, 1942 and is buried in the Terlingua Cemetery. She was attended by Chisos Mining Company physician W.N. Kelley for the week prior to her death. (3). Daughter Maria Molinar was born in Terlingua March 22, 1911. She was a student at the Molinar School in 1925. On September 22, 1947 she married Cornelio Betancourt, son of Miguel Betancourt and Felipa Pichardo. He was born March 15, 1920 in Terlingua. They lived in the Terlingua area until at least 1939. They eventually moved to Odessa, where Cornelio died on March 13. 1964. He is buried in Odessa. Maria died in Odessa March 20, 1984..
(4). Son Tomas Molinar was born in Terlingua April 29, 1918. He was a student at the Molinar School in 1925. He died in Odessa on April, 1 1964 and is buried in the Odessa Cemetery. He married Jesus Gomez, who was born circa 1917. She was the daughter of Felix Gomez and Benigna Galindo. They had five children. aa. Daughter Sandra Sanchez Molinar was born January 8, 1972 in Brewster County. bb. Daughter Gloria Sanchez Molinar was born August 2, 1973 in Brewster County. cc. Son Manuel Molinar, Jr. was born July 12, 1974 in Brewster County. dd. Daughter Noemi Sanchez Molinar was born November 6, 1976 in Brewster County. ee. Son Fortino Sanchez Molinar was born August 12, 1979 in Brewster County. b. Son Tomas Molinar was born October 1, 1944 in Brewster County. In 1986 he was living in Seminole. c. Son Wilfredo “Will” Molinar was born March 30, 1947 in Brewster County. d. Son Felix Molinar was born October 30, 1951 in Brewster County. He was living in Odessa in 1986.
e. Son Noel “Noe” Molinar was born October 30, 1959 in Presidio County. He was living in Alpine in 1986. (5). Son Alfredo Burgess Molinar was born in Terlingua January 31, 1918. He was a student at the Molinar School during the 1925-1926 school year. 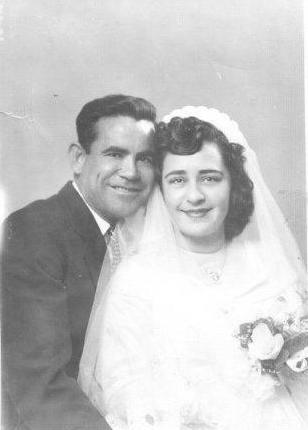 On November 16, 1940 he married Beatrice Jaquez. She was born in Terlingua May 11, 1921, the daughter of Agapito Jaquez and Ofelia Rodriguez. (For more information on the Jaquez family, see http://www.lifebeforetheruins.com/gregorio-jaquez.html) Alfredo died in Odessa December 20, 1997. Alfredo and Beatrice had four children. a. Daughter Dora J. Molinar was born November 8, 1941 in Brewster Co.
b. Daughter Delia Alva Jaquez Molinar was born November 20, 1943 in Brewster Co.
c. Son Alfredo Molinar was born February 23, 1946 in Brewster Co.
d. Daughter Delma Molinar was born December 9, 1946 in Brewster Co.
(6). Son Daniel Molinar was born June 20, 1920 in Terlingua. He married Maria Urquieta July 12, 1941. She was born circa 1922 in Texas, the daughter of Juan Urquieta and Mauricia Martinez. (See http://www.lifebeforetheruins.com/juan-urquieta.html for more information on the Urquieta family). Daniel died on their 53rd wedding anniversary, July 12, 1994, in Odessa and is buried there. L-R: Benigna Molinar, Manuela Chavez, bride & groom, Manuela Valenzuela. Daniel and Maria had five children. aa. Son Randy Charles Roman was born in Odessa November 17, 1964.
bb. Son Rodney Charles Roman was born in Odessa November 28, 1967.
cc. Son Ryan Charles Roman was born in Odessa September 6, 1975.
aa. Daughter Deborah Jo Lynn Fierro was born August 2, 1963 in Odessa. bb. Son Sabas Fierro, Jr. was born August 20, 1967 in Odessa. cc. Son Brent Fierro was born June 22, 1976 in Odessa. aa. Daughter Aubree Deann Roman was born in Odessa September 2, 1973.
bb. Son Jon Daniel Roman was born in Odessa August 23, 1979.
aa. Daughter April Lysette Molinar was born March 3, 1981 in Odessa. bb. Son Daniel Travis Molinar III was born April 4, 1982 in Odessa. cc. Daughter Carrie Felice Molinar was born May 15, 1984 in Odessa. f. Son Paz Molinar was born May 7, 1950 in Alpine. He married Tina Guerrero. a. Daughter Odilia Angelica Molinar was born 4 September 1944 in Brewster County. b. Son Jorge Molinar was born 20 May 1946 in Brewster County. (8). Son Alfonso “Poncho” Molinar was born September 10, 1924 in Terlingua. He married Maria Zamarron May 3, 1942. She was born in Terlingua November 23, 1923, the daughter of Martin Zamarron and Dolores Huerta. They had two children. a. Daughter Rita Molinar was born 23 May 1942. She married David Ramirez and in September 2010 they were living in El Paso. b. Son Antonio Molinar was born 9 May 1944 in Brewster County. He and his wife Delma were living in Alpine in September 2010. Alfonso Molinar and Maria Zamarron were divorced in the mid 1940’s. Alfonso married Teresa Villanueva from Fort Davis on December 7, 1946 in Fort Davis. She was born on June 28, 1928 and died in an automobile accident in 1989. Alfonso died September 21, 2010 and is buried in the Carlsbad Cemetery. Alfonso and Teresa had five children. a. Son Alfonso Molinar, Jr. was born in Fort Davis August 19, 1947. He and his wife Connie were living in Carlsbad, New Mexico in September 2010.
b. Son Adan Molinar was deceased by September 2010.
c. Daughter Eva Molinar married Adolfo Hinojos. In September 2010 they were living in Carlsbad. d. Daughter Emma Molinar was born June 5, 1950 in Fort Davis. Sje married Ruben Irizarry. In September 2010 they were living in Carlsbad. e. Daughter Alva Molinar was living in Carlsbad in September 2010. Her married name is Yocum. a. Daughter Esther Molinar was born April 4, 1952 in Brewster County. Her married name is Hernandez and she was living in Clute, Texas in November 1998.
b. Son Rogelio Molinar, Jr. was born January 11, 1954. He was living in Odessa in November 1998.
aa. Daughter Stephanie Ann Garza was born May 26, 1976 in Odessa. d. Daughter Celia “Sally” Molinar was born May 20, 1960 in Odessa. She was living in Odessa in November 1998.
e. Son Rudy Molinar was born May 1, 1965 in Odessa and was living in Odessa in November 1998. (10). Son Alejandro Molinar was born February 9, 1929 in Terlingua. He died off malignant jaundice in Terlingua February 18, 1934. He is buried in a small cemetery on a hilltop just north of the Paz Molinar home site. (11). Daughter Ernestina Molinar was born March 19 1932 in Brewster County. She was the flower girl in the wedding of Josefina Hernandez and Juan G. Molinar in February 1942.
a. Son Roman Arispe, Jr. was born January 20, 1950 in Alpine and died there May 28, 1952. He is buried in Alpine. b. Son Jesus Armando Arispe was born February 23, 1952 in Alpine. c. Daughter Mary Belinda Arispe was born November 18, 1953 in Alpine. a. Daughter Dora M. Hernandez was born February 3, 1962 in Zavala County. b. Son Juan Jesus “J.J.” Hernandez was born June 26, 1967 in Ector County. a. Daughter Guadalupe Valenzuela was born November 29, 1929 in Terlingua. She was living in Alpine between 1943 and 1948. She died there June 28, 1948 of Typhoid Fever and is buried in Alpine. b. Son Felix G. Valenzuela was born May 18, 1931 in Brewster County. c. Daughter Estela Valenzuela was born September 15, 1933 in Alpine and died there May 28, 1934. She is buried in Alpine. d. Daughter Lucia Valenzuela was born December 4, 1938 in Brewster County. (2) Daughter Luz Gonzalez was born September 6, 1909 in Presidio, Texas. She married Guillermo Rodriguez on November 29, 1929 in Terlingua. He was born February 10, 1906 in Terlingua, the son of Guillermo Rodriguez and Sixta Duran. He was working for the Chisos Mining Co. in August 1927, employee number 699. On August 13 he suffered an injury to his foot and missed work for six days. He was a resident of Odessa between 1948 and 1968. He died in Medical Center Hospital 17 October 1968 and is buried in the Odessa Cemetery. Luz and Guillermo had three children. a. Son Manuel Rodriguez was born September 18, 1930 in Brewster County. He was deceased by February 2008.
aaa. Daughter Amanda Luzinda Gonzales was born November 24, 1981 in Odessa. bb. Daughter Esther Martinez was born September 4, 1958 in Odessa. She married Leo Garza. cc. Son Robert R. Martinez, Jr. was born August 20, 1960 in Odessa. His wife’s name is Sandra. dd. Daughter Patsy Ann Martinez was born June 29, 1962 in Odessa. Her married name is Dominguez. ee. Son Randall Martinez was born October 2, 1970 in Odessa. aa. Son Daniel Hernandez Rodriguez was born January 10, 1953 in Odessa. a. Daughter Elizabeth Betancourt was born July 25, 1950 in Brewster County. She married Rodolfo Daniels. They were living in Odessa in May 2009.
aa. Daughter Megan Diane Garcia was born May 3, 1984 in Odessa. bb. Daughter Brittany Marie Garcia was born September 26, 1986 in Odessa. (4) Son Filberto Gonzalez Jr. was born April 21, 1913 in Presidio. He died from an accidental dynamite explosion while working for the Tarrant Mining Co. June 26, 1934. He is buried in the Terlingua Cemetery. a. Daughter Olivia Gonzalez was born February 15, 1941 in Brewster County. b. Daughter Maria Oralia Gonzalez was born January 31, 1945 in El Paso County. c. Daughter Ofilia Gonzalez was born August 10, 1946 in Brewster County. d. Daughter Olga Gonzalez was born July 1. 1949 in Brewster County. e. Daughter Olean Chacon Gonzalez was born January 17, 1952 in Brewster County. f. Daughter Orphalinda Chacon Gonzalez was born March 16, 1955 in Ector County. g. Son Paz Chacon Gonzalez, Jr. was born March 25, 1962 in Ector County. h. Son Ray Gonzalez was born March 23, 1962 in Ector County. (6) Daughter Maria Gonzalez was born in Presidio April 4, 1916. 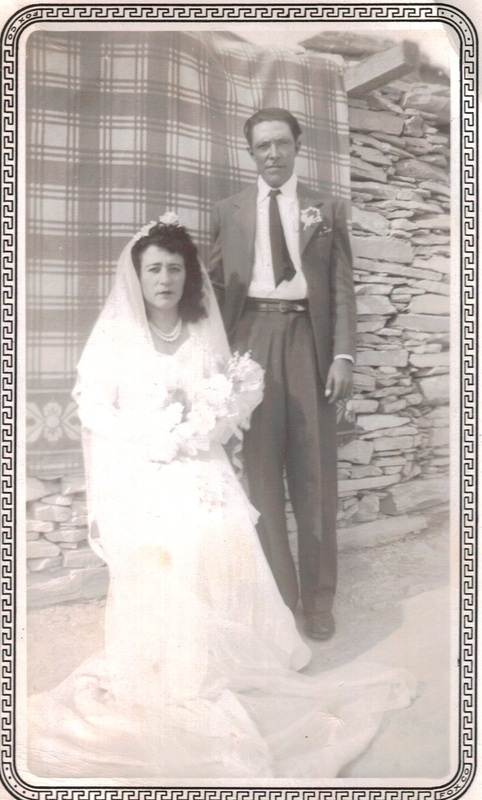 She married Alberto R. Jaquez September 19, 1936 in Terlingua. The son of Agapito Jaquez and Ofelia Rodriguez, he was born December 19, 1915 in Terlingua. He was baptized April 2, 1916 in Chisos by Father M. Cuadrado. His godparents were Jose Hinojos and Victoria Madrid. Maria died in Medical Center Hospital, Odessa on June 20, 1988. Alberto died December 2, 1991. Both are buried in the Kermit, Texas Cemetery; their graves are marked. Maria and Alberto had three children. aa. Son Raymond Ortega was born July 8, 1958 in Odessa. bb. Son Juan Xavier Ortega was born April 3, 1961 in Odessa. b. Son Alberto Jaquez, Jr. was born In Brewster County August 23, 1939. In 1987 he was living in Roanoke, Texas. He died July 8, 1989 and is buried in the Kermit Cemetery. aa. Son Alvaro Martinez, Jr. was born in Brewster County in February 1964.
bb. Daughter Maria Christina Martinez was born in Ector County February 11, 1965.
cc. Daughter Veronica Martinez was born in Brewster County March 8, 1968. In 1910 Jose was living in Marathon, where he was a boarder with his cousin Antonio Franco. He was working as a laborer in the rubber factory at the time. Jose was from a family of freighters, and from 1916 through 1918 he pursued that profession. In the last four months of 1916 he hauled over 53 tons of freight for the Study Butte Mining Company, earning $532.87. In 1917 he hauled nearly 161 tons of freight for the same company, earning $1.694.05, and in 1918 he hauled over 87 tons, earning $1,121.97. However, in the 1920 census his occupation was shown as “Laborer, general” and in 1930 as “Farm laborer”. In 1934 and 1936 he was working for the Chisos Mining Company. In April 1936 he suffered a foot injury when an ore bucket overturned on it. He missed six days work as a result. He received half pay for the time missed. From 1944 to 1965 Jose was a resident of Alpine, where he worked as a bricklayer in the construction industry. He died at his residence in Alpine December 18, 1965 from pneumonia and cancer. Isabel died in Odessa September 23, 1982. Both are buried in Holy Angels Cemetery. a. Son Manuel J. Molinar was born March 23, 1944. He died in Odessa February 8, 1977. (2). Daughter Elisa Molinar was born in Terlingua in 1920 and was living there with her parents in 1930. Her married name was Torres. She was deceased by April 2000.
a. Son Oscar Grado was born May 20, 1941 in Brewster County. In April 2008 he was living in Fort Stockton. b. Son Adan Grado was born January 24, 1944 in Brewster County. He was living in Odessa in April 2008.
c. Son Manuel Grado, Jr. was born July 22, 1945 in Ector County. He was living in Presidio, Texas in April 2008.
d. Son Raul Grado was born June 14, 1947 in Ector County. He died in Ector County September 16, 1982.
e. Daughter Rosa Elva Grado was living in Fort Stockton in April 2008. Her married name is Arenivas. f. Son Jose Grado was living in Hobbs, New Mexico in April 2008.
g. Daughter Maria Grado was living in Fort Stockton in April 2008. Her married name is Dominguez. (4). Son Carlos Molinar was born in Terlingua in 1924 and was living there with his parents in 1930. (5). 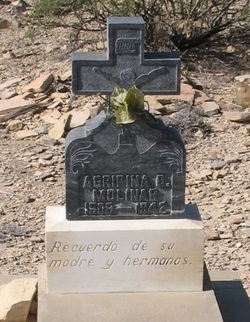 Son Adolfo Molinar was born in Terlingua in 1925. In September 2011 he was living in San Mateo, California. Adolfo served in the U.S. Army for 25 years. He served in the South Pacific during World War II, where he fought in the Battle of Leyte Gulf. He later served in Berlin, Germany and finally in Viet Nam. He met his wife, Vera Janischewski, in Berlin. (6). Son Jose Molinar was born in Terlingua in 1928. He died in Odessa March 19, 1991. (7). Son Cruz Molinar was born May 3, 1933 in Brewster County. In April 2008 he was living in Presidio, Texas. (8). Daughter Consuelo Molinar was born February 2, 1939 in Brewster County. In February 2000 she was living in Odessa, where she died March 25, 2006. Her married name was Machuca. Victoriano Molinar and Rosario Galindo Mesa had seven children: F. Maria, G. Vicente, H. Victoriano, I. Valente, J. Cruz, K. Andres, L. Eduardo. F. Daughter Maria Molinar was born in November 1889. In 1900 she was living with her parents in Presidio. G. Son Vicente Molinar was born December 11, 1893 (a) in Presidio, Texas. He married Candelaria Armendariz in Jesus Nazareno Temple, Ojinaga on October 16, 1918. She was born February 2, 1898 in Ojinaga, the daughter of Victor Armendariz and Maria De Los Angeles Alvarez. As a teenager Vicente worked in the silver mines in Shafter. After marriage, he settled in Alpine where he worked as a laborer on the railroad. Candelaria died May 17, 1985. Vicente died on October 14, 1994 at his residence in Alpine, Texas. Both are buried in Holy Angels Cemetery. (1) Son Ramon Armendariz Molinar was born in Alpine April 12, 1921. He married Josefina Mercedes Ramos May 6, 1946. She was born in Alpine September 24, 1922, the daughter of Solomon Ysidro Ramos and Josefa Cobos. They made their home in Alpine, where Ramon worked as a brick layer. He was a WW II Veteran, serving as a Private First Class with the Military Police Platoon of the 75th Infantry Division. Ramon died in Brewster County Memorial Hospital May 6, 1961. Josefina died in Alpine August 9, 2003. Both are buried in Holy Angels Cemetery. Ramon and Josefina had seven children. aa. Daughter Rosita Molinar was born November 13, 1971 in Brewster County. She was living in Boerne, Texas in May 2004.
bb. Daughter Sarita Molinar was born May 11, 1978 in Harris County. She was living in San Marcos, Texas in May 2004.
cc. Son Luis Molinar was born September 26, 1980 in Harris County. He was living in Alpine in May 2004.
aa. Daughter Jessica Ann Molinar was born November 10, 1973 in Brewster County. Her mother was Rebecca Grace Granado. bb. Daughter Martha Brito Molinar was born October 5, 1981 in Brewster County. Her mother was Ana Maria Brito Contreras. aa. Daughter Tiffany Ann Slack was born September 6, 1972 in Brewster County. bb. Son Robert Raymond Slack, Jr. was born in Galveston May 25, 1985.
d. Son Ruben Molinar was born May 29, 1953 in Alpine. In May 2004 he was living in Riverside, California. e. Daughter Angelica Molinar was born May 1, 1955 in Alpine and was still living there in May 2004.
f. Daughter Josefina Laura Molinar was born October 8, 1956 in Brewster County. She was living in Little Rock, Arkansas in May 2004. Her married name is Mann. g. Daughter Monica Molinar was born October 13, 1959 in Alpine and was still living there in May 2004.
a. Son Victoriano Molinar was born March 23, 1943 in Brewster County. a. Daughter Mary Ann Molinar was born May 4, 1948 in Brewster County. In April 2007 she was living in Midland. Her married name is Blair. b. Daughter Cora Molinar was born August 24, 1949 in Brewster County. In April 2007 she was living in Alpine. Her married name is Chavez. c. Son Samuel Molinar was born January 29, 1952 in Brewster County. d. Son Elpidio “Pio” Molinar was born June 24, 1955 in Brewster County. He was living in Alpine in April 2007.
e. Daughter Elisa “Lisa” Molinar was born June 17, 1963 in Brewster County. She was living in Alpine in April 2007.
f. Daughter Sylvia Molinar was living in Alpine in April 2007. Her married name is Ramos. g. Daughter Victoriana Molinar was living in Seminole in April 2007.
h. Son Raul Molinar was living in Alpine in April 2007. Victoriano’s obituary also list son Joe Rodriguez. He was living in California in April 2007. (3). Son Jose Molinar was born circa 1925 in Alpine. He died June 19, 1943 from a knife wound to the chest. He is buried in Alpine. (4). Son Luz Molinar was born March 24, 1926 in Alpine. a. Son Joe Gallego III was born August 30, 1946 in Brewster County. In April 1999 he was living in Corona, California. aa. Son Brian Briceño was born February 20, 1971 in Reeves County. aa. Daughter Marlene Briceño was born November 19, 1968 in Reeves County. bb. Son Edward Briceño was born July 17, 1971 in Reeves County. cc. Daughter Amber Monique Gallego Briceño was born August 13, 1986 in Brewster County. d. Son Billy Joe Gallego was born July 16, 1950 in Brewster County. He was living in Saragosa in April 1999.
e. Son Freddy Gallego was born September 12, 1951 in Brewster County. In April 1999 he was living in Pecos. f. Son Tony Gallego was born August 18, 1953 in Brewster County. In April 1999 he was living in Presidio, Texas. g. Son Samuel “Sammy” Gallego was born May 16, 1955 in Brewster County. In April 1999 he was living in San Angelo. h. Son Jimmy Gallego was born February 12, 1957 in Brewster County. In April 1999 he was living in Saragosa. i. Daughter Alexa Gallego was born November 9, 1959 in Brewster County. In April 1999 she was living in San Angelo. j. Son Alan Gallego was living in Pecos in April 1999.
k. Daughter Alexa Gallegos was living in San Angelo in April 1999.
a. Son David Javier Portillo was born July 12, 1962 in Brewster County. b. Son Jaime Portillo was born July 17, 1963 in Brewster County. (7). Son Francisco Molinar was born April 2, 1935 in Brewster County. (7). Son Francisco Molinar was born April 2, 1935 in Brewster County. (8). Son Raul “Chief” Molinar was born April 2, 1935 in Brewster County. a. Son Sammy Roy Espinosa was born May 5, 1958 in Brewster County. b. Daughter Yvonne Molinar Espinosa was born June 5, 1959 in Brewster County. c. Son Leopoldo Espinosa, Jr. was born April 7, 1962 in Brewster County. d. Daughter Claudia Melissa Espinosa was born January 15, 1965 in Brewster County. (10). Son Jose “Joe” Molinar was born in Brewster County on November 27, 1943. In April 2007 he was living in San Antonio. H. Son Victoriano Molinar was born January 24, 1894 (a) in El Indio, Presidio County, Texas. He was baptized in El Indio March 10, 1894 by Father Brocardus. His godparents were Justo Gonzalez and Carmen Molinar. He was living with his parents in Presidio in 1900. I. Son Valente Molinar was born in September 1895 and was living with his parents in Presidio in 1900. J. Daughter Cruz Molinar was born in January 1897 and was living with her parents in Presidio in 1900. K. Son Andres G. Molinar was born February 4, 1898. He married Manuela Ramirez. She died in 1972 and he died December 26, 1980. They are buried in Holy Angels Cemetery, Alpine. a. Son Rudolfo “Rudy” Torres. Molinar was born November 22, 1951 in Brewster County. He was living in Alpine in 2010.
b. Daughter Rosalinda Torres Molinar was born December 6, 1952 in Brewster County. She was living in Alpine in 2010. Her married name is Jordan. c. Daughter Yolanda Torres. Molinar was born February 1, 1955 in Brewster County. She was living in Alpine in 2010.
aa. Son Juan Israel Martinez was born June 19, 1982 in Brewster County. bb. Son Chale Eugene Molinar Martinez was born October 31, 1983 in Brewster County. bb. Daughter Emery Jaclyn Sanders was born December 13, 1977 in Andrews County. cc. Son Charles Jacob Sanders was born February 5, 1979 in Brewster County. aa. Daughter Sara Jenifer Molinar was born November 28, 1984 and died December 9, 2003. She is buried in Holy Angels Cemetery in Alpine. She had one son, who is living in Odessa. bb. Daughter Sophie Molinar was living in Odessa in 2010.
cc. Daughter Sandra Molinar was living in Odessa in 2010.
dd. Son Andrew Molinar was living in Odessa in 2010.
a. Daughter Dianna Molinar was born December 16, 1953.
b. Daughter Carmela Molinar was born November 23, 1956 in Brewster County. She died July 29, 1973 of injuries suffered in an automobile accident in Alpine and is buried in Holy Angels Cemetery. a. Daughter Belinda Ybarra was born in Brewster Co. May 18, 1955. Her married name is Viscaino. She was living in Midland in February 2008.
b. Daughter Melva Ybarra was born in Brewster County April 9, 1957. She was living in Midland in February 2008. Her married name is Almodova. c. Daughter Delpha Ybarra was born in Brewster County December 19, 1958. She was living in Midland in February 2008. Her married name is Norton. d. Daughter Guadalupe Molinar Ybarra was born December 15, 1964 in Brewster County. Her married name is Martinez. In February 2008 she was living in Midland. aa. Son Edmundo Ybarra, Jr. was born August 16, 1974 on Travis Air Force Base, Fairfield, California. He graduated from Lee High School in Midland in 1993. He died from injuries suffered in a traffic accident in Odessa May 15, 2002.
bb. Son John Matthew Ybarra was born in Pecos County September 6, 1979. (4). Son Francisco Molinar was born in Brewster County February 4, 1938. (5). Daughter Eva Molinar was living in San Diego, California in February 2008. He married name is Rodriguez. (6). 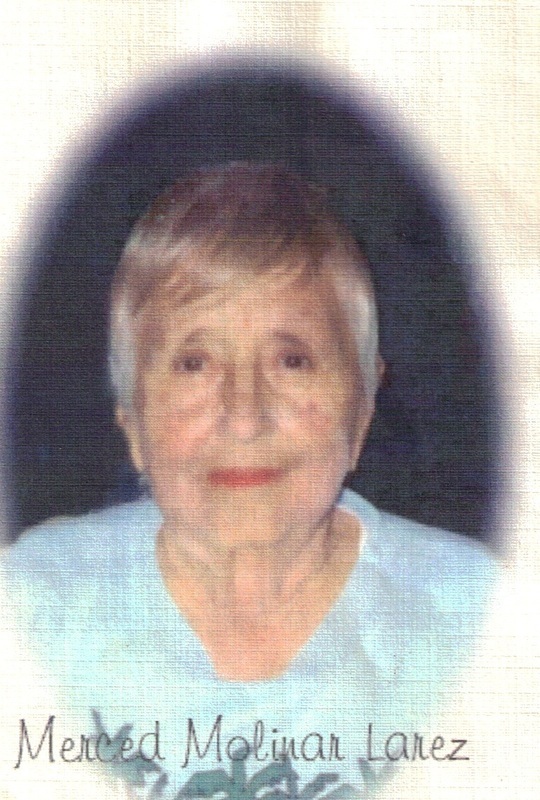 Daughter Dora Molinar was living in Alpine in February 2008. I. Son Eduardo G. Molinar was born November 30, 1900 in Shafter, Texas. He married Conrada Jaquez in Terlingua June 4, 1922. She was born February 19, 1903 in Lajitas, Texas, the daughter of Romaldo Jaquez and Severa O. Contreras. She was baptized in Lajitas May 16, 1903 by Father Brocardus. Her godparents were Macario and Severiana A. Hinojos. Eduardo died in Alpine August 24, 1971 and Conrada died in Valley Star Nursing Home in 1987. Both are buried in Holy Angels Cemetery. Eduardo died in Alpine August 24, 1971 and Conrada died in Valley Star Nursing Home in 1987. Both are buried in Holy Angels Cemetery. Eduardo and Conrada initially made their home in the Terlingua area, probably near the home of his brother Alberto. Eduardo hauled freight for the local mining companies, did some farming, and also may have worked in the mines. By December 1932 they had moved to Alpine, where Eduardo worked at various jobs, including shearing sheep and selling produce. He occasionally worked out of town, including one time when they went to Bakersfield, California to work in the fields. (1). Daughter Rosa Chacon was born March 3, 1923 in Terlingua. She married Jose Chacon, Jr. He was born August 5, 1921 in Terlingua, the son of Jose Chacon and Elvira Moreno. Rosa and Jose lived in Terlingua until daughter Olga was born in August 1943, but moved to El Paso soon afterward. He worked for Phelps-Dodge Copper Refinery from 1944 until he retired with 35 years service in 1979. Jose died in El Paso November 18, 1992 and Rosa died there January 17, 2004. They had eight children. Please see http://www.lifebeforetheruins.com/preciliano-chacon.html for details and for more information on the Chacon family. (1). Son Vicente J. Molinar was born November 8, 1924 in Terlingua (Chisos). He was baptized November 24, 1924 in Chisos by Father Salvador M. Giran from St. Agnes Catholic Church in Terlingua. His godparents were Hilario and Elisa Cordova. He was a U.S. Navy Veteran. In 1987 he was living in Alpine. He died May 3, 1991 and is buried in Holy Angels Cemetery. aa. Daughter Debra Ann Arrieta was born January 15, 1962 in Midland County. bb. Daughter Cindy Arrieta was born July 13, 1964 in Ward County. b. Son Frederico “Fred” Terrazas, Jr. was born in Brewster County August 19, 1945. (4). Daughter Carolina Jaquez Molinar was born March 21, 1928 in Terlingua. She died May 4, 1996 and is buried in Holy Angels Cemetery, Alpine. She married Arturo Moreno White, who was born February 17, 1922 in Lajitas, Texas, the son of John White and Cruz Moreno. He died April 10, 1998 in Big Bend Regional Medical Center, Alpine and is buried in Holy Angels Cemetery. For many years Carolina and Arturo owned and operated the Terlingua Store, located along Highway 170 between Terlingua Creek and the Terlingua Ghost Town. a. 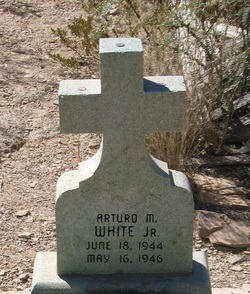 Son Arturo White, Jr. was born June 18, 1944 in Terlingua. He died of “extensive burns from ignition of gasoline” on May 16. 1946. He was buried the same day in the Terlingua Cemetery. b. Son Roberto White was born October 12, 1945 in Brewster County. In April 1998 he was living in Odessa. b. Son John White was born June 4, 1947 in Terlingua. In April 1998 he was living in Alpine. aa. Daughter Christina White Gardea was born May 14, 1975 in Odessa. bb. Son Martin White Gardea. Jr. was born September 25, 1979 in Odessa. cc. Daughter Lizette White Gardea was born August 27, 1991 in Odessa. d. Son Hector White was born March 23, 1952 in Terlingua. In May 1996 he was living in Terlingua and in April 1998 he was living in Odessa. e. Daughter Delia White was born in Terlingua September 18, 1955 and was living there in April 1998. (5). Daughter Elisa Molinar was born October 4, 1929 in Terlingua. She married Luis Bustos in Alpine January 9, 1945. They were married by Justice of the Peace R.C. Garnett. In 1996 she was living in Monahans, TX. She died in Monahans March 1, 2002. (6) Daughter Aurora Molinar was born March 28, 1931 in Terlingua. She was living in Fresno, California in February 2003. Her married name is Garcia. (7). Daughter Guadalupe Molinar was born prematurely on December 11, 1922 in Alpine and died there two days later. She is buried in Alpine. (8). Son Eduardo Molinar, Jr. was born in Alpine October 31, 1934. He attended Centennial School in Alpine and was living in Alpine in 1987.
a. Son Juan Efren Molinar was born in Alpine May 19, 1950. In November 2011 he was living in Alpine. b. Son Edmundo Molinar was born in Alpine June 24, 1963. In November 2011 he was living in Odessa. c. Son Oscar Molinar was born in Alpine April 2, 1966. In November 2011 he was living in Alpine. d. Daughter Evangeline Molinar was born in Alpine September 21, 1969. In November 2011 she was living in San Antonio. b. Daughter Denise Molinar was living in Alpine in March 2009. Her married name is Valles. c. Daughter Debra Jean Molinar was born February 4, 1974 in Brewster County. She was living in Alpine in March 2009. Her married name is Valles. d. Daughter Jennifer Molinar was living in Alpine in March 2009. Her married name is Garcia. e. Ramona’s son Joe Herman Garcia was living in Odessa in March 2009.
f. Ramona’s son Noel Salas was living in El Paso, TX in March 2009.
a. Son Luis Portillo Hernandez, Jr. was born October 1, 1959 in Brewster County. b. Daughter Carol Jean Hernandez was born October 20, 1961 in Brewster County. c. Son Armando Molinar Hernandez was born July 28, 1863 in Brewster County. d. Daughter Delfie Conrada Hernandez was born September 7, 1968 in Brewster County. e. Son Christopher Molinar Hernandez was born October 8, 1973 in Brewster County. a. Daughter Kimberly Jean Molinar was born August 18, 1968 in Brewster County. She was living in Alpine in March 1994.
b. Daughter Jessica Lynne Molinar was born June 20, 1973 in Brewster County. She was living in Alpine in March 1994.
c. Daughter Rosa Linda Molinar was born November 12, 1979 in Brewster County. She was living in Alpine in March 1994. (11). Son Armando Molinar was born November 6, 1944 in Alpine. He died in Alpine October 1, 1946 and is buried there. A. Son Miguel Molinar was born September 1887 in Texas. In 1900 he was living with his parents in Presidio and probably lived there all of his life before going into Valley Hi Nursing Home in 1975. He died February 7, 1976 in Valley Hi Nursing Home in Alpine and is buried in Presidio. B. Son Conrado Molinar was born February 1889 in Texas and was living with his parents and attending school in Presidio in 1900. C. Son Patricio Molinar was born circa 1891 in Texas. In 1920 he was living with his parents in Presidio County and was working as a day laborer. D. Son Manuel Molinar was born December 1892 in Texas. In 1900 and 1920 he was living in Presidio with his parents. He died in Methodist Hospital, Lubbock, TX of heart failure on March 23, 1973 and is buried in Peaceful Gardens Memorial Park, Lubbock. E. Daughter Sofia Molinar was born June 1895 in Texas and was living with her parents in Presidio in 1900. F. Daughter Petra Molinar was born December 1896 in Texas and was living with her parents in Presidio in 1900. G. Son Mariano Molinar was born circa 1904 in Texas In 1920 he was living with his parents in Presidio, where he was working as a day laborer. (1). Nasario Molinar was born July 27, 1936 in Presidio County. He married Inez Calderon Vasquez and they had 5 children. a. Daughter Maria Isabel Molinar was born February 2, 1961 in Odessa. b. Daughter Imelda Maria Molinar was born October 12, 1961 in Odessa. c. Daughter Delfina Molinar was born September 15, 1964 in Odessa. d. Daughter Irene Marie Molinar was born April 21, 1966 in Odessa. e. Daughter Teresa Molinar was born October 3, 1967 in Odessa. a. Son Michael Angelo Regaldo was born December 18, 1959 in Odessa. b. Son Richard Joseph Regaldo was born May 12, 1961 in Wichita County. c. Son Daniel Joe Regaldo was born February 24, 1966 in Hale County. a. Son Daniel Villarreal Jr. was born February 10, 1969 in Dallas. b. Daughter Kari Lynn Villarreal was born October 21, 1973 in Taylor County. Daniel Villarreal died and Anita married Warren Lee, who also is deceased. Anita and Warren had no children. a. Daughter Erlinda Molinar was born June 14, 1964 in Lubbock. a. Son Antonio Gonzales, Jr. was born February 25, 1972 in Lubbock. b. Daughter Monica Anne Gonzales was born October 30, 1977 in Lubbock. a. Son Michael Lee Molinar was born June 13, 1975 in Hale County, Texas. He died in Tarrant County November 13, 1992.
b. Son Cruz Molinar III was born January 2, 1979 in Collin County, Texas. c. Son Marcus Allen Molinar was born October 14, 1989 in Fort Worth. a. Daughter Dora Molinar was born August 25, 1954 in Hale County, Texas. b. Daughter Irma Molinar was born January 29, 1957 in Odessa. c. Son Jesus Molinar was born March 17, 1958 in Odessa. d. Daughter Diana Molinar was born January 15, 1961 in Wichita County, Texas. e. Son Antonio Molinar was born October 7, 1964 in Odessa. 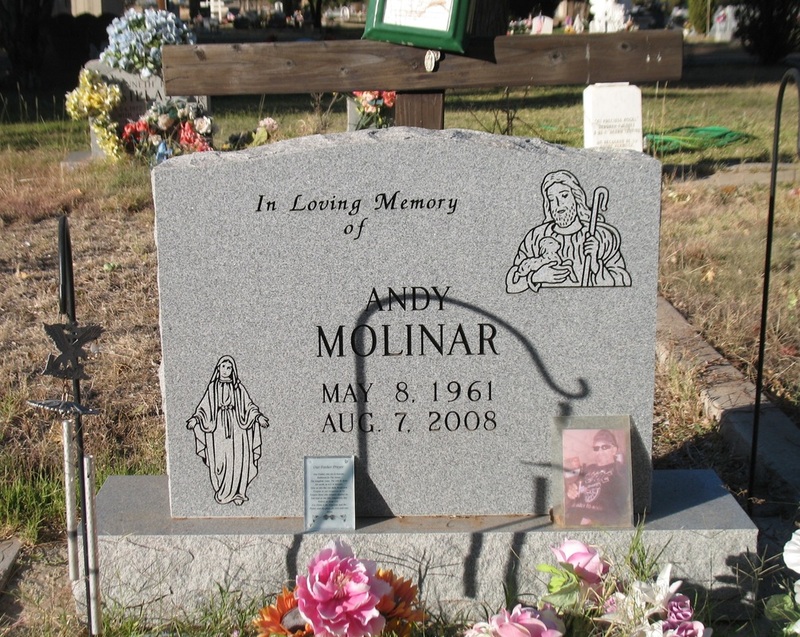 f. Son Adam Molinar was born January 23, 1966 in Odessa. a. Daughter Rosalinda Carrasco Molinar was born October 4, 1960 in Odessa. b. Son Fernando Baca Molinar, Jr. was born July 11, 1962 in Odessa. c. Son Adolfo Molinar was born May 20, 1963 in Odessa. d. Son Luis Carrasco Molinar was born September 30, 1965 in Odessa. e. Daughter Patricia Ann Molinar was born June 16, 1968 in Odessa. f. Son Joel Molinar was born August 23, 1971 in Odessa. (9). Daughter Margarita Molinar married Manuel Segura and they had no children. a. Daughter Barbara Ann Molinar was born December 15, 1973 in Dallas. b. Daughter Elizabeth Maria Molinar was born February 16, 1978 in Collin County. c. Son Robert Molinar, Jr. was born September 29, 1982 in Collin County. A. 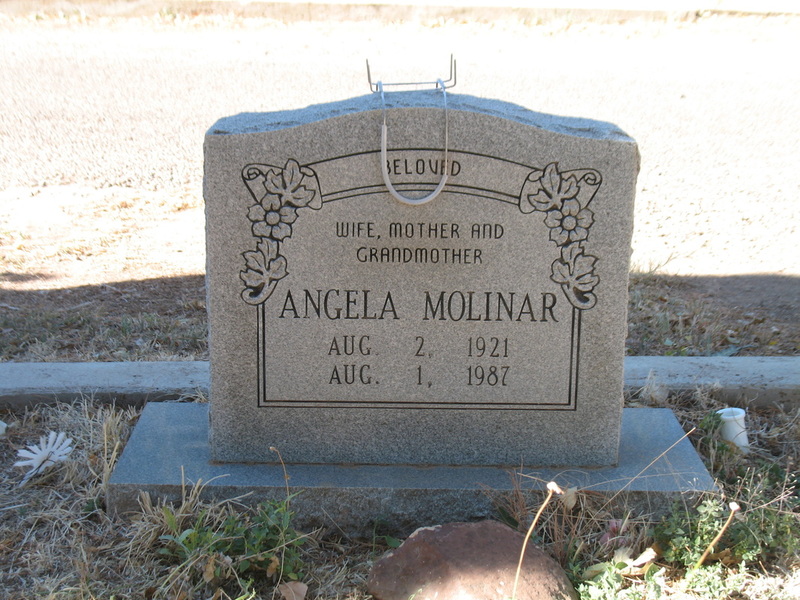 Daughter Guadalupe Molinar was born November 1886 in Presidio County. In 1900 she was living in Presidio with her parents. B. 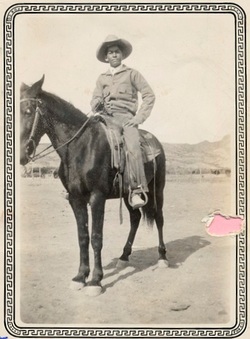 Son Jose Molinar was born March 1889 in Presidio County. In 1900 he was living with his parents in Presidio. (1). Daughter Paula Molinar was born June 18, 1925 in Presidio County. She died August 11, 1956 in Presidio and is buried in the Presidio Catholic Cemetery. (2). Daughter Francisca Molinar was born June 8, 1935 in Presidio County. In July 2007 she was living in Presidio. (3). Son Silverio Molinar was born April 12, 1937 in Presidio, Texas and died there of measles January 29, 1941. He is buried in Presidio. a. Son Grady Clinton Huffman, Jr. was born January 16, 1961 in Presidio County. b. Daughter Brenda Kay Huffman was born July 16,1963 in Culberson County. a. Daughter Rosalinda Hoyer was born in Presidio County October 3, 1962.
b. Daughter Graciela Hoyer was born in Presidio County September 5, 1965.
c. Daughter Denise Molinar Hoyer was born in Brewster County May 25, 1971.
d. Son Guillermo Hoyer, Jr. was born in Brewster County April 1, 1974. (6). Son Manuel Molinar was born December 26, 1944 in Presidio County. In July 2007 he was living in Presidio. (7). Son Alberto Molinar was born March 14, 1946 in Presidio County. In July 2007 he was living in Presidio. (8). Son Alfredo Molinar was born January 12, 1949 in Presidio County. In July 2007 he was living in Presidio. (9). Daughter Maria Molinar was born January 16, 1951 in Presidio County. a. Son Francisco Molinar Alvarez was born July 12, 1951. In 1971 he was living in Pecos, Texas, where he was working as a dishwasher in a café. He died Marcy 21, 1971 when he was shot in the head with a rifle. 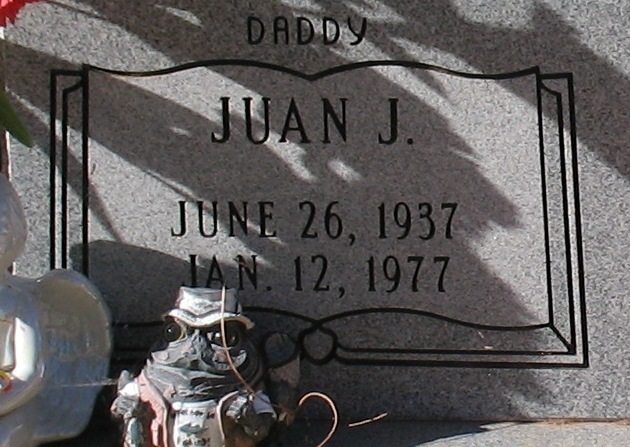 He is buried in Santa Rosa Cemetery in Pecos. a. Son Martin Ramirez was born November 11, 1952.
b. Daughter Margarita Ramirez was born August 9, 1955.
c. Daughter Maria Guadalupe Ramirez, twin of Mario, was born July 26, 1957.
d. Son Mario Ramirez, twin of Maria Guadalupe, was born July 26, 1957.
e. Son Ruben Ramirez was born May 10, 1961.
f. Daughter Berta Lydia Ramirez was born December 1, 1963.
g. Son Jaime Ramirez was born February 11, 1965.
h. Son Eduardo Ramirez was born August 23, 1966.
i. Son Alfonso Ramirez was born October 24, 1970.
j. Daughter Rosario Ramirez was born July 11, 1974.
a. Son Juan Antonio Molinar Brito was born in Brewster County August 2, 1986.
b. Son Emmanuel Molinar Brito was born in Brewster County November 29, 1968. (13). Son Luis Molinar probably was born in Presidio County. In July 2007 he was living in San Jose, California. a. Daughter Maria Del Carmen Molinar was born May 4, 1950 in Presidio. She died as an infant. aa. Son Guillermo Antonio Molinar was born April 26, 1984 in Brewster County. bb. Daughter Tanya Marie Molinar was born July 27, 1988 in Uvalde County, Texas. cc. Daughter Elena Molinar (triplet) was born December 23, 1991 in Bexar County, Texas. dd. Son Daniel Molinar (triplet) was born December 23, 1991 in Bexar County. c. Son Guillermo Jimenez Molinar, twin of Jose Antonio Molinar, was born December 5,1951 in Presidio County. He died as an infant. aa. Daughter Amanda Molinar was born in Alpine March 26, 1987. Rene later married Norma Cobos. In July 2007 he was living in Presidio. aa. Son Jose Alonzo Molinar Muniz, Jr. was born October 18, 1992 in Brewster County. bb. Daughter Maria Del Carmen Muniz was born December 9, 1997 in Midland. a. Son Francisco “Paco” Torres was living in Chihuahua, Mexico in July 2007.
b. Daughter Nancy Torres was living in Presidio in July 2007. 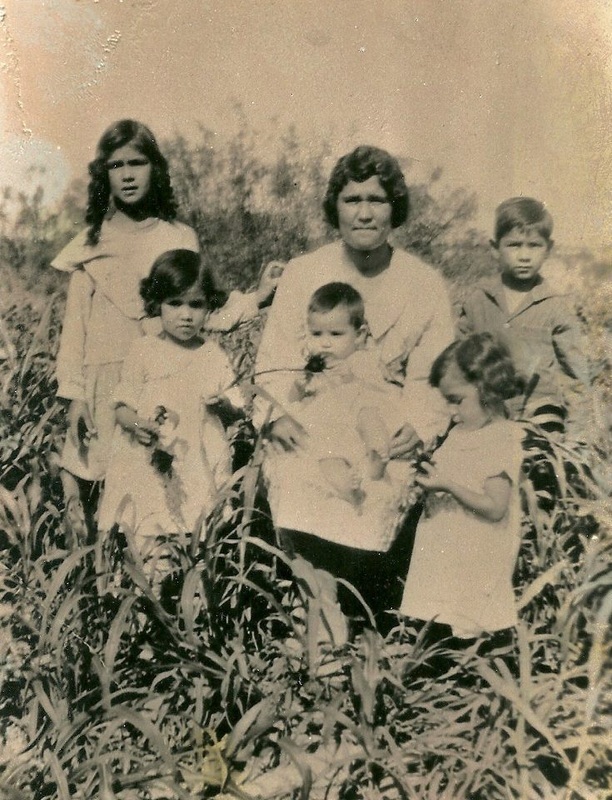 D. Daughter Maria Molinar was born May 1894 in Presidio County. She was living in Presidio with her parents in 1900. E. Son Felipe Molinar was born February 5, 1895. He was baptized March 4, 1985 at Rancho de la Santa Cruz. E. Son Justo Molinar was born September 1895 in Presidio County. He married Estanislada Aguilar. 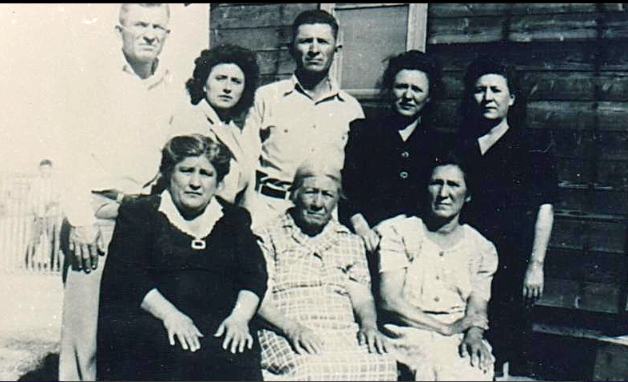 In 1930 they were living in Vado de Piedra, Chihuahua, Mexico. They had twelve children. a. Son Luis Efren Molinar. d. Daughter Rosa E. Molinar. Her married name is Almance. e. Daughter Ester Molinar. Her married name is Gomez. (2) Son Jose Molinar was born circa 1923. He was living with his parents in Vado de Piedra in 1930 and in Visalia, California in June 2011. (3). Daughter Teodora Molinar was born circa 1925. She was living with her parents in Vado de Piedra in 1930. She married Ignacio Armendariz in Tulare, California December 6, 1980. They were living in Fresno, California in June 2011.
a. Daughter Rosa Flores was born February 28, 1953 in Presidio, Texas. She died there of pneumonia May 30, 1953 and was buried the next day by her father in the Presidio Catholic Cemetery. b. Son Raul Molinar Flores was born December 11, 1953 in Presidio County. He was living in Carlsbad in August 2011.
c. Son Jaime Molinar Flores was born August 5, 1955 in Presidio County. He was living in Artesia, New Mexico in August 2011.
d. Daughter Adel Molinar Flores born January 29, 1957 in Presidio County. She was living in Odessa in August 2011. Her married name is Hernandez. e. Son Alfonso Molinar Flores was born October 6, 1959 in Jeff Davis County. He was living in Midland in August 2011.
f. Son Pedro Molinar Flores was living in Midland in August 2011.
g. Son Jose Molinar Flores was living in Carlsbad, New Mexico in August 2011. (5). Son Isabel Molinar was living in Vado de Piedra in 1930 and in Pecos, Texas in June 2011.
a. Son Reyes “Ray” Molinar was born March 5, 1967 in Odessa and was living there in May 2010.
b. Daughter Rose Mary Molinar was born 25 May 1968 in Odessa and was living there in May 2010. Her married name is Medrano. c. Daughter Maria Luisa Molinar was living in Odessa in May 2010. Her married name is Sotelo. d. Daughter Adelaida Molinar was living in Pecos in May 2010. Her married name is Lopez. a. Daughter Dora Elsa Molinar was born December 6, 1963 in Reeves County. She married Pedro Almance and in June 2011 they were living in Reeves County. b. Son Cosme Molinar was born January 13, 1965 in Reeves County. He died in Odessa August 14, 1983.
c. Daughter Luz Estella Molinar was born March4, 1968 in Presidio County. She married Carlos Martinez and in June 2011 they were living in Odessa. d. Daughter Sylvia Molinar was born May 1, 1969 in Presidio County. She married Israel Suchil and in June 2011 they were living in Lubbock. e. Daughter Daniella Molinar married James Porras. In June 2011 they were living in Midland. f. Son Jesus P. Molinar, Jr. was living in Odessa in June 2011. His wife’s name is Paula. g. Son Carlos A. Molinar was living in Odessa in June 2011. His wife’s name is Claudia. h. Son Dario P. Molinar was born July 5, 1986 in Odessa. He was living in Odessa in June 2011. His wife’s name is Sylvia. (8). Daughter Maria Molinar was living in Odessa in June 2011. Her married name is Castillo. (9). Daughter Eva Molinar was living in Presidio, TX in June 2011. Her married name is Salas. (10). Daughter Elisa Molinar was living in California in May 2010. Her married name was Hernandez. She was deceased by June 2011. (11). Son Lorenzo Molinar was living in Ojinaga, Chihuahua, Mexico in May 2010 and on Rancho Gayton, Mexico in June 2011. (12). Son Ricardo Molinar was deceased by May 2010. 5. Son Atilano Molinar was born circa 1856 in Mexico. He was living at Rancho del Alamo, Presidio County, in 1880 with his parents. Circa 1889 he married Maria Quiroz, daughter of Dolores Quiroz and Calistra Alvarez. In 1900 they were living in Presidio with four children. A fifth child was born in Presidio in 1902. In 1900 Atilano was working as a farmer. He died on Ochoa Ranch, near Presidio, June 18, 1931. Maria died in 1952. Atilano and Maria had nine children. A. Son Francisco Molinar was born April 9, 1890 in Presidio. He was baptized April 20, 1890 in Presidio by Father de Palma. His godparents were Anastacio and Gertrudis Galindo. In 1900 he was living with his parents in Presidio. B. Daughter Librada Molinar was born in December 1890 in Texas. In 1900 she was living with her parents in Presidio. (1). Daughter Manuela Franco. She died January 16, 2009. (2). Son Ricardo Franco was born circa 1927. He died in Loving, New Mexico February 2, 1945. (3). Son Cruz “Indio” Franco was born in Shafter, Texas August 5, 1928. D. Daughter Josefa Molinar was born in Nov. 1896 in Texas. (1). Son Atilano Molinar was born circa 1925. In 1930 he was living with his parents in Shafter. (2). Daughter Socorro Molinar was born February 6, 1928 in Shafter and was living there with her parents in 1930. (3). Daughter Sulema Molinar was born June 8, 1930 in Presidio County. (1). Daughter Rosa Molinar was born in 1927 and died May 30, 1927 in Loving, NM. (2). Son Balbino Molinar was born in 1928. He died in Marfa, TX August 13, 1928 and was buried in Shafter, TX the following day. (4). Daughter Margarita Molinar. Her married name was Estrada. (5). Son Adan Molinar died in 2012. (6). Daughter Maria Ludica Molinar. Her married name was Jaime. (1). Son Ramon Larez was born in Archer County, Texas May 13, 1927. (2). Son Rodolfo “Rudy” Larez was born in Wichita Falls, Texas October 24, 1928. (3). Daughter Enedina Larez was born in Wichita Falls June 16, 1930. (4). Son Tiburcio Larez was born July 10, 1934. (5). Daughter Miranda Larez was born July 4, 1939. (6). Daughter Olga Larez was born February 15, 1942. Her married name was Onsurez. 6. Daughter Carmen (possibly Carla) Molinar was born in Mexico circa 1866. In 1880 she was living with her parents at Rancho del Alamo, Presidio County. She married Justo Gonzalez June 9, 1882 in Jesus Nazareno Temple in Ojinaga. He was born in 1859, the son of Nepomuceno Gonzalez and Paula Ramirez. Carmen and Justo had six children. A. Paula Juana Gonzalez was born December 17, 1885 in Texas. She was baptized in Presidio on December 27, 1885. Her godparents were grandparents Nepomuceno Gonzalez and Paula Ramirez. B. Son Ireneo Gonzalez was born March 12, 1887 in Texas. He was baptized in Presidio on May 2, 1887. His godparents were grandparents Nepomuceno Gonzalez and Paula Ramirez. He was a resident of Shafter and a rancher. 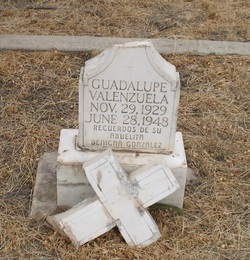 He died January 1, 1954 in Marfa of heart problems and was buried in Shafter the following day. C. Son Guadalupe Gonzalez was born December 12, 1889 in Presidio, Texas. He was a rancher. He died in Brewster Memorial Hospital, Alpine on July 28, 1971 and is buried in Merced Cemetery, Marfa, Texas. D. Son Justo Gonzalez was born January 1, 1895. He was baptized January 5, 1895 in El Indio, Presidio County, Texas. His godfather was Eugenio Gonzalez. E. Daughter Luciana Gonzalez was born circa 1903. She died in Presidio on August 21, 1929 and is buried there. F. Son Jose Gonzalez was born circa 1907 in Texas. He died in Presidio, Texas on January 12, 1962 and was buried the following day in Indio, Presidio County. Note: (a) The birth dates for Vicente and Victoriano are as they appear in records. Vicente’s birth date is as it appears in his obituary and on his grave stone. Victoriano’s birth date is as it appears in his baptism record. One of the dates apparently is incorrect. Another possibility is they actually were the same person. This is supported by the fact that only one of them (Victoriano) appears in the 1900 census. - Brewster and Presidio County Census Records. - Marriage, baptism, and burial records from Jesus Nazareno Temple in Ojinaga, Chihuahua, Mexico, accessed via the FamilySearch web site. - Brewster, Presidio, Winkler, Midland, Ector, Pecos, Harris and Ward County death records. - Baptism records from St. Agnes Catholic Church in Terlingua, available on microfilm from the L.D.S. Church. - Louisa Madrid Family Research. - Personal observations by the author. - Contributions by numerous Molinar descendents. - Chisos Mining Company Records, Archives and Information Services Division, Texas State Library and Archives Commission.